Article by Writing IE Admin © 5 October 2015 . I have a confession to make. I’m a bit of an obsessive. I once got so obsessed with sailing I bought all the yachting magazines as soon as they came out, without going anywhere near the water. When I actually did, I hated it (although I don’t think the experience was helped by a raging hangover). The trouble is that in the past I’ve flitted from one obsession to another and often – therefore – become a Jack of all trades, master of none. As well as the devotion to theoretical yachting, at various times I’ve been an slavish Neil Young fan (I gave up after thirty-odd albums), a motorhome enthusiast (it got nicked when someone took it for a jolly to the 2006 World Cup), and a golf addict (my high point was being 13th reserve for the English Mid Amateur after getting my handicap down through determined wangling rather than ability). At this point a true obsessive would have tried again. But I didn’t. I just moved on to the next big thing. In my case starting an indiepop band (the highpoint of which was a couple of self-booked tours of Germany and being played by Steve Lamacq on 6 Music). But after a few years that, too, was going nowhere fast. Thankfully the next change of direction saw me returning to that obsession of a decade before. One that most desk-bound journalists aspire to: writing a novel to try to escape office drudgery. I took it absolutely seriously this time, and after exhaustive research I signed up for City University’s first Crime Thriller MA (chosen because it’s the only one where to graduate you must write a full-length novel). Things started to go downhill when I had my interview. The overall course director, Jonathan Myerson, had loved my writing sample (one of my earlier unpublished crime thriller novels), but was a little put out that my list of favourite books contained not one single crime title. In fact, the only crime book on my five favourite and least favourite chart was Barbara Vine’s (aka the late Ruth Rendell’s) 2001 novel Grasshopper – and that was top of my list of ‘hates’. This was pretty much sacrilege for a would-be crime writer. Nevertheless, Jonathan gave me a place. The head of the crime option at City is Northern Irish crime writer Claire McGowan (ably assisted at that time by Roger Morris and Guardian crime critic Laura Wilson). Claire was reasonably positive about my writing – but hated the novel I was planning to write: a bawdy 18th century romp with a morally dubious main character. Thankfully, in the first term we were encouraged to try different potential starts of novels covering things like characterisation, plot, and setting. And in trying to think of a different setting, I remembered reading Stasiland on my band’s tour of Germany. So I dreamt up the opening chapter of a novel set in 1970s East Berlin, where a female People’s Police murder squad head is called to the scene of a body at the foot of the Berlin Wall. When she gets there, she discovers the Stasi are really in charge, and her job is simply to find evidence to back up their version of events: that the girl was shot from the west while trying to escape into the east. Claire loved this as a premise and so Stasi Child was born. After that, it was Laura Wilson who worked on the nuts and bolts with me. I was also very lucky to secure Philip Sington as my guest tutor, as I’d loved his East German-set novel, The Valley of Unknowing. Roger Morris had introduced us to Peter May’s Lewis Trilogy – and I ‘adopted’ Peter’s structure of The Lewis Man where two separate narratives flip flop and eventually collide. Then at the shortlisting stage for the MA course prize – sponsored by London literary agents, Peters Fraser & Dunlop – an up and coming young agent with PFD, Adam Gauntlett, rang me out of the blue and said he absolutely loved the novel and wanted to sign me up. This time I won the prize, and unlike twelve years earlier, the finished draft was never shown to anyone else. So I was spared that ubiquitous and demoralising round of rejections. 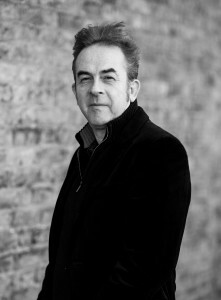 A five-figure deal with Fleuve Editions for French rights swiftly followed, as did a three-book deal with Bonnier’s new debut imprint, Twenty7 Books. TV rights have also been optioned by the revived Euston Films (of Minder and The Sweeney fame). So it’s all very exciting, but scary. Reviews have been good and there’s a buzz on Twitter. All I can do now is try to promote the novel as much as possible … obsessively, in my case, as you might imagine. After all, I’m an obsessive, and if you’re an aspiring writer that’s no bad thing. Just stick with it, learn from the rejections, and keep going. Eventually – with a bit of luck – you might succeed in seeing your book on the bestsellers shelf. That – anyway – is what I hope is the destiny for Stasi Child. But even if it isn’t, I hope this time I won’t give up. When Oberleutnant Karin Müller is called to investigate a teenage girl’s body at the foot of the Wall, she imagines she’s seen it all before. But when she arrives she realises this is a death like no other. It seems the girl was trying to escape – but from the West. Müller is a member of the People’s Police, but in East Germany her power only stretches so far. The Stasi want her to discover the identity of the girl, but assure her the case is otherwise closed – and strongly discourage her from asking questions. The evidence doesn’t add up, and it soon becomes clear the crime scene has been staged. But this is not a regime that tolerates a curious mind, and Müller doesn’t realise that the trail she’s following will lead her dangerously close to home . 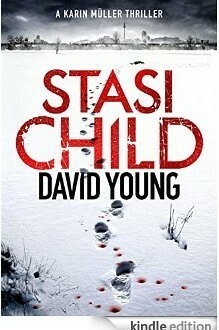 . .
Stasi Child is David Young’s brilliant and page-turning debut novel, pick up your copy online here!